As a kid I always watched my mom, salt the sliced brinjals and set them against each other to let the water drain off, she didn’t know why she did it, and I thus got no answer till I read this rather interesting article on www.seriouseats.com that gives you the scientific explanation to it! Simply put, salting drains out the excess water from the brinjal and renders it crisp when you cook it! The trick is to buy a heavy brinjal, as that’s less porous. The Chinese are known to leave their chopped brinjals in salt water for at least an hour to get the same result. I’ve never tried and tested the difference but according to the writer on seriouseats, salting is a better process to follow. What’s more it also soaks up a lot less oil once it’s salted! 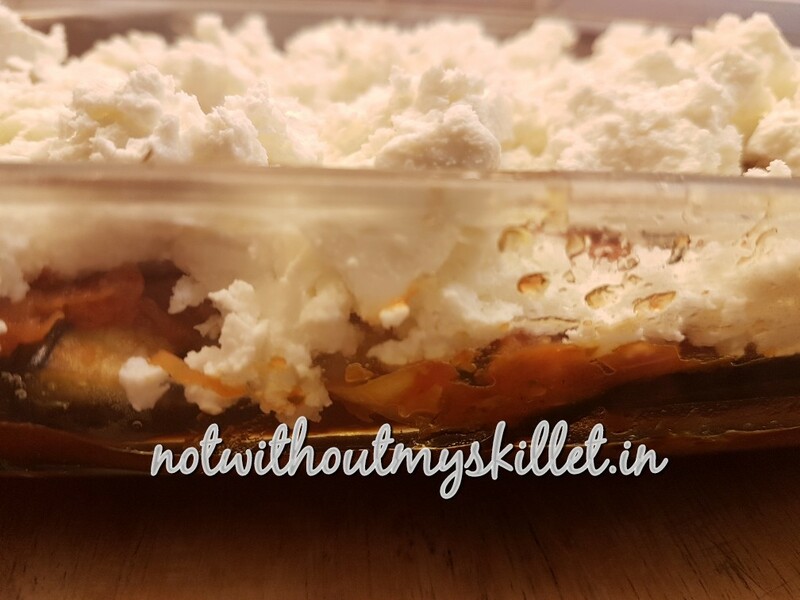 So coming back to the recipe, it needs just 6 main ingredients and is really quick to make. It can be combined with a salad for a simple meal or served as part of a main course for a party. You can make this dish as healthy or decadent as you want. I preferred the healthy route. But for a party i suggest you layer it with Mozzarella, Parmesan and cottage cheese. 🙂 Decadence…I tell you…I love it! You can grill this as a family casserole or as individual portions too–that’s sexier! 1. Salt the sliced brinjals and place them one against each other for at least 30 minutes. 2. Pre-heat your grill to 180 degree centigrade. 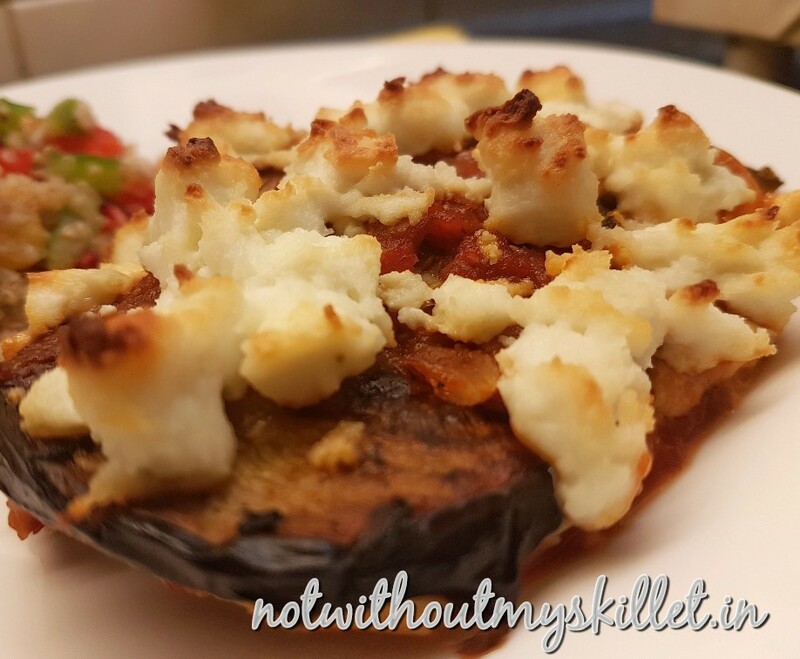 It’s fine to let the brinjal get a few dark spots! It’s all going to be hidden under the luscious sauce! 4. 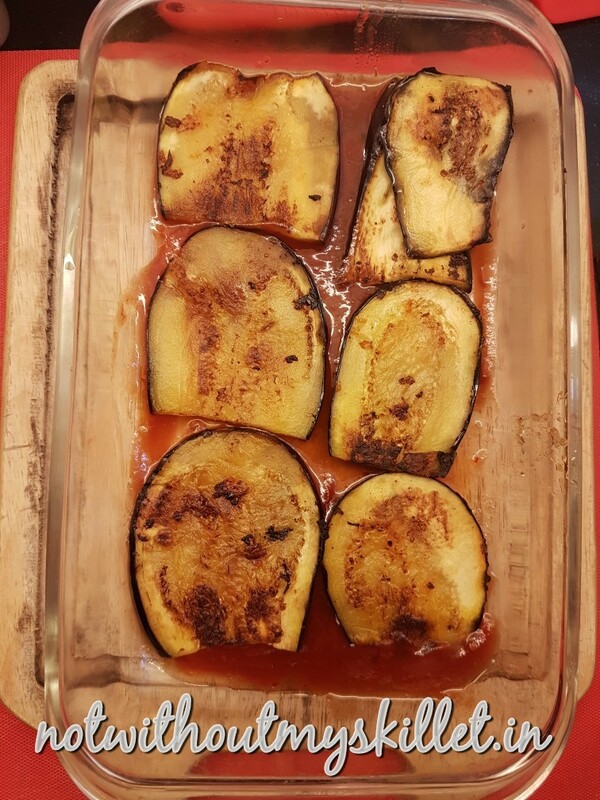 Once the brinjal has drained off, pat them dry on a paper towel and start frying them in a skillet till they are golden. Use a non-stick pan to prevent your brinjal from absorbing too much oil. I’ve used 1 teaspoon of oil to fry the entire lot. My sauce is a little on the drier side, that’s how we like it and when you bake the dish, it will let out some amount of liquid. But you could use a thinner version of the sauce too. 5. Now start layering your bake. At the base you could use the sauce you just made, or use a combination of tomato ketchup and the sweet-chilli sauce. 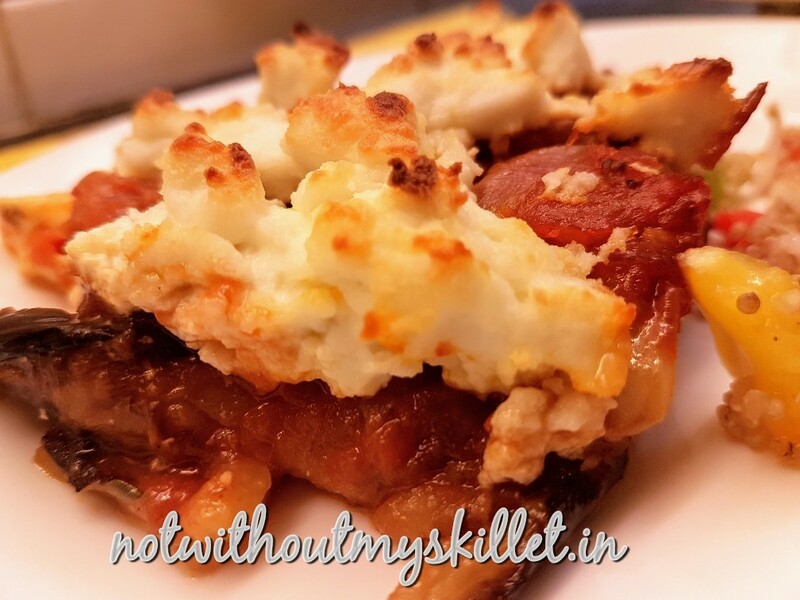 Place a layer of the fried brinjal on top of this. Then layer it with the sliced processed cheese (you could add mozzarella here instead of the sliced cheese). Add another layer of the sauce, top with the brinjals and yet another layer of the sauce. Now crumble the cottage cheese all over the top. If you wish to you can add a layer of parmesan cheese here. Unless I’m cooking for a party, I avoid the cheese. I love this look, almost like the snow topped mountains I so miss! Cottage Cheese is healthy, so don’t hold back on it. 6. Grill it for 20 minutes at 180 degrees till the cottage cheese starts to crisp up and get golden. 7. Serve it hot with a salad. I served it with a couscous salad. 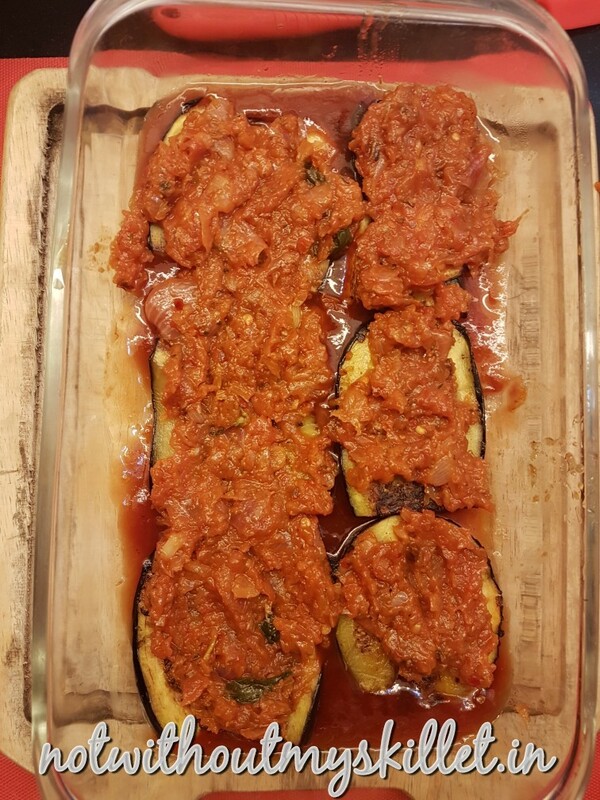 Eat it hot or eat it cold…it’s the dish that will make you fall in love with the aubergine all over again!